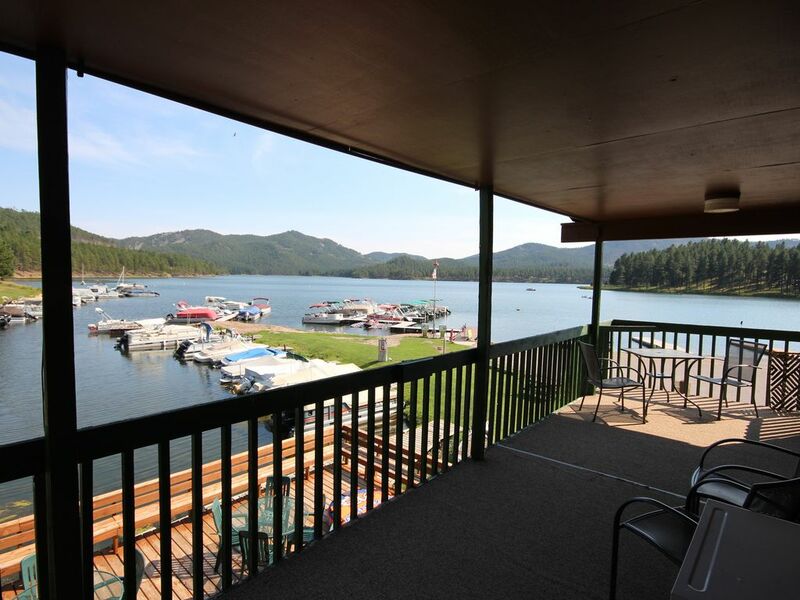 Stunning Lakefront Rental no Black Hills - SHERIDAN LAKE. ADA acessível! Não existe mais belo cenário no Black Hills do que a vista do seu terraço privado com vista para Sheridan Lake! O nosso recém-redecorado (2016) apartamento de férias privado acomoda até 8 e oferece uma cozinha totalmente equipada, lavanderia, TV satélite e acesso gratuito à internet WiFi. Este espaçoso apartamento 2 º andar oferece mais de 1.100 pés quadrados de espaço de estar, uma entrada privada e privadas 300 m² cobertos deck com vista para a bacia do barco. A praia, passeios de barco e pesca estão a poucos passos de distância. Aproveite seu café da manhã a partir do convés, enquanto vê o nascer do sol sobre o lago! Novo para 2016: agora estamos totalmente acessíveis a ADA / ABA! Um dos três quartos, a cozinha e o banheiro agora são acessíveis aos nossos clientes com necessidades de mobilidade. Nossa nova rampa de acesso conecta o apartamento do 2º andar à nossa área de estacionamento (uma distância de 100 pés). A sua estadia em Sheridan Marina lhe dá direito a taxas de desconto aluguer de barcos (na época) e 10% de desconto todas as entradas na vizinha Horse Creek Inn - melhor churrascaria da área. Se você vem para o seu ideal de férias de verão, outono ou inverno viagem de caça aventura pesca no gelo nós sabemos que você absolutamente vai aproveitar a sua estadia! The property was clean and very comfortable. More spacious than I imagined from the photos. We stayed for a family ice fishing weekend. What a beautiful view from the deck! Would highly recommend for a winter trip and we would love to book it now for a summer trip. Thank you for taking the time to review your stay. We're glad you enjoyed it and hope to see you again this summer! Great place to stay on the lake. Mark was very accommodating and had everything we needed for an enjoyable stay. Thank you for taking the time to review your stay. We're glad you enjoyed it and we look forward to seeing you again soon! The apartment was comfortable and was located in an area where one could easily visit the Black Hills sights. Just 10 minutes from Hill City. The apartment had all the amenities you would need; there was no phone, but you could use your cell phone to call if wifi calling was enabled. There were quite a few flies in the apartment-- coming inside through closed doors/windows to escape the cold temperatures. The heater in the bathroom did not work, which I'm certain management will get fixed. We rented early in October after their summer season was done. The apartment is located above the marina. Very quiet and beautiful area. If we return, we will rent earlier in the season. Thank you for taking the time to review your stay. We've checked the bathroom heater and found that the control knob was missing but otherwise worked. We'll get that fixed asap. Late September in the Hills brings out the pack flies, and try as we may, we can never completely rid the place of the pesky critters. We're glad you enjoyed your stay and hope to see you again soon! A WOMDERFUL GETAWAY...GREAT SERVICE AND VERY NICE HOSTS...PERFECT FOR OUR FAMILY...WE HOPE TO RETURN NEXT SUMMER IN JULY...THANKS!!! Thank you for taking the time to post your review. We look forward to seeing you again. Thank you for taking the time to post your review. We're glad you enjoyed your stay and look forward to seeing you again soon! Localizado a 25 milhas ao sul de Rapid City no coração do Black Hills. 5 milhas a nordeste de Hill City, 20 minutos para Mt Rushmore, 45 minutos para Deadwood. Sheridan Lake abrange 383 hectares e tem 7. 5 milhas de costa. Rates and availability are subject to change until reservation is confirmed.